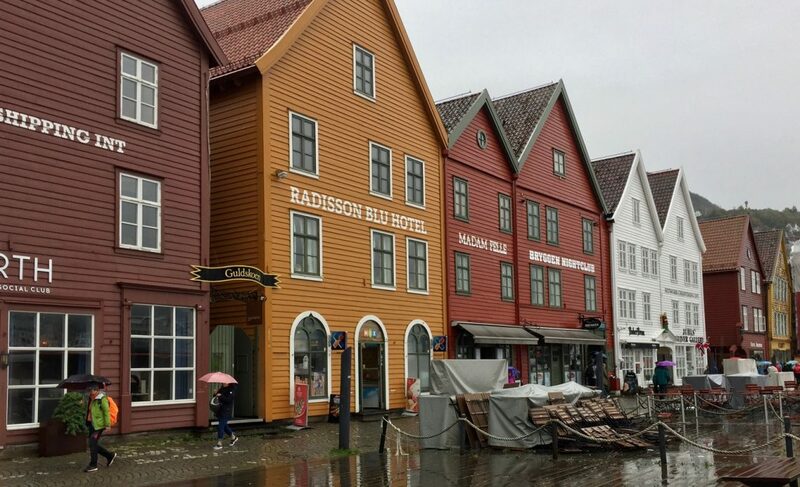 “Bergen is called the city of rain,” said our guide Simone. 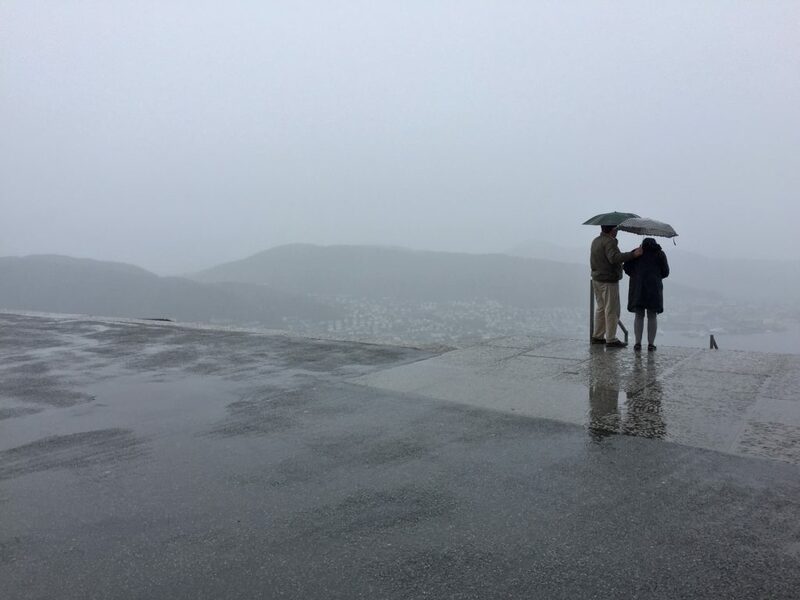 “We get about 240 days of rain per year and we have many hours of darkness.” Not to despair, sightseeing in Bergen is fun even in the rain. I can truly attest to that since my sister N and I spent our final day of touring in this legendary seaport amidst very soggy weather. Bergen was our last stop in Norway on our Viking Homelands cruise aboard the Viking Star, courtesy of Viking Ocean Cruises. * We weren’t going to let a few raindrops spoil our exploration. That’s why I like vacationing with my sister N, she is a traveling trooper! The Bryggen wharf is known for its wooden houses. We decided to spend the first hour on a panoramic bus tour of Bergen so we could stay warm for part of the time before exploring by foot. “The city is known for it’s historic wooden houses,” said Simone as we rode along the UNESCO-listed Bryggen wharf. 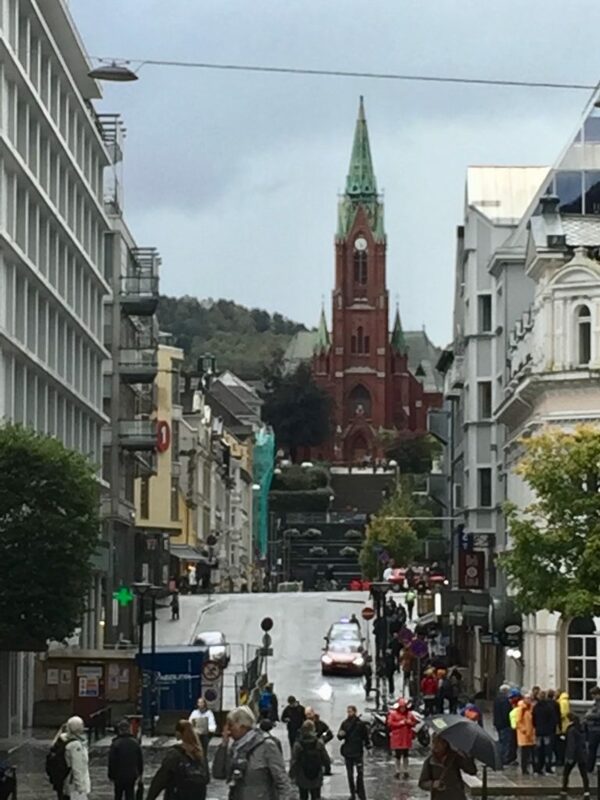 Our drive took us past St. Mary’s Church, the oldest church in Bergen and Ovregarten, the town’s oldest street. Simone said this street was the red-light district long ago. St. Mary’s is the oldest church in Bergen. 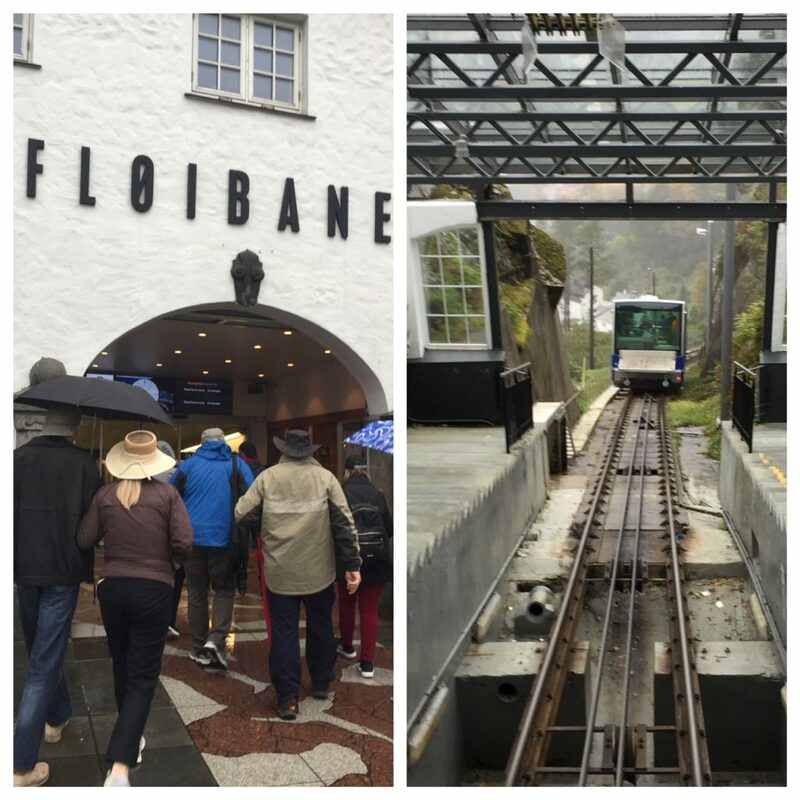 “Floyen is one of the most important mountains in Bergen,” said Simone. We knew it would be foggy on top of the mountain but we went up anyway, riding the funicular railway to 320 meters above sea level. It took about 8 minutes to reach the peak. We took the funicular to the top of Fløyen. Had it been a sunny day we would have seen amazing views over Bergen – on a rainy day not so much. There are hikes and mountain biking tours available weather permitting. Well there’s always a next time! Meantime, we went inside the souvenir shop which has very cute gifts. The view from the mountain top on a foggy day. Simone was quite knowledgeable about Bergen’s history and provided highlights as we headed back to port. 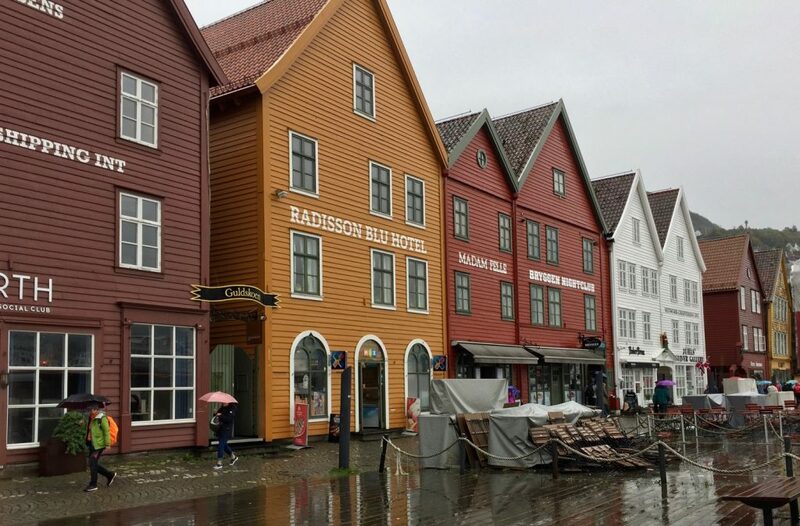 “Bergen is the second largest city in Norway,” she said. “It is the home port of Viking Cruises.” We learned that the city was bombed during WWII and that Norway was a poor country until the middle of the 20th century. In fact, many Norwegians moved to the USA at that time. Can you guess where they moved? 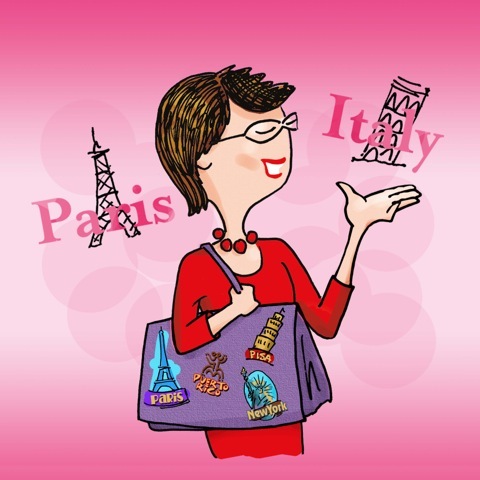 “They moved to cold and rainy places like Minneapolis and Seattle,” said Simone. “Today, Americans come to Norway to learn about their ancestors,” she added. 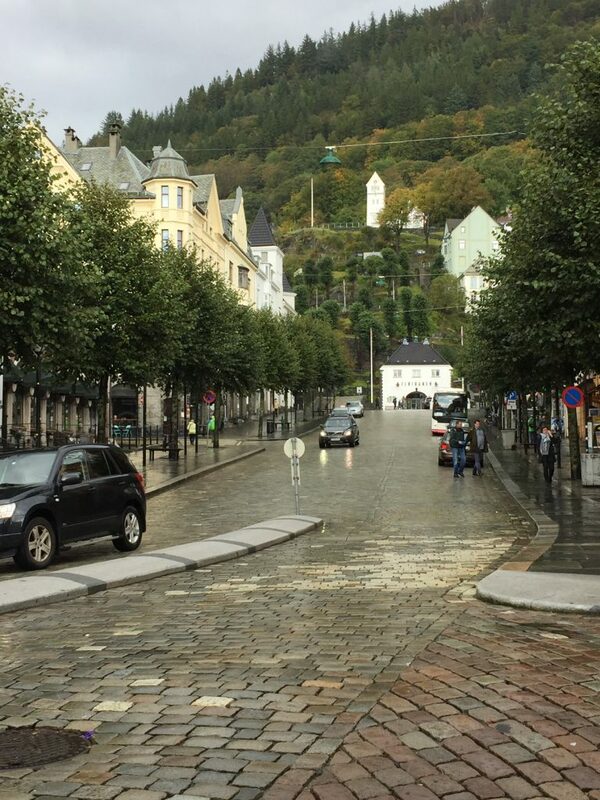 A pretty Bergen scene after a rainy day. We also learned about some of the famous people who hail from Bergen. Do you know who they are? “Henrik Ibsen is the famous playwright from Bergen. He wrote A Doll’s House and Hedda Gabler. Edvard Grieg is the internationally successful Norwegian composer. 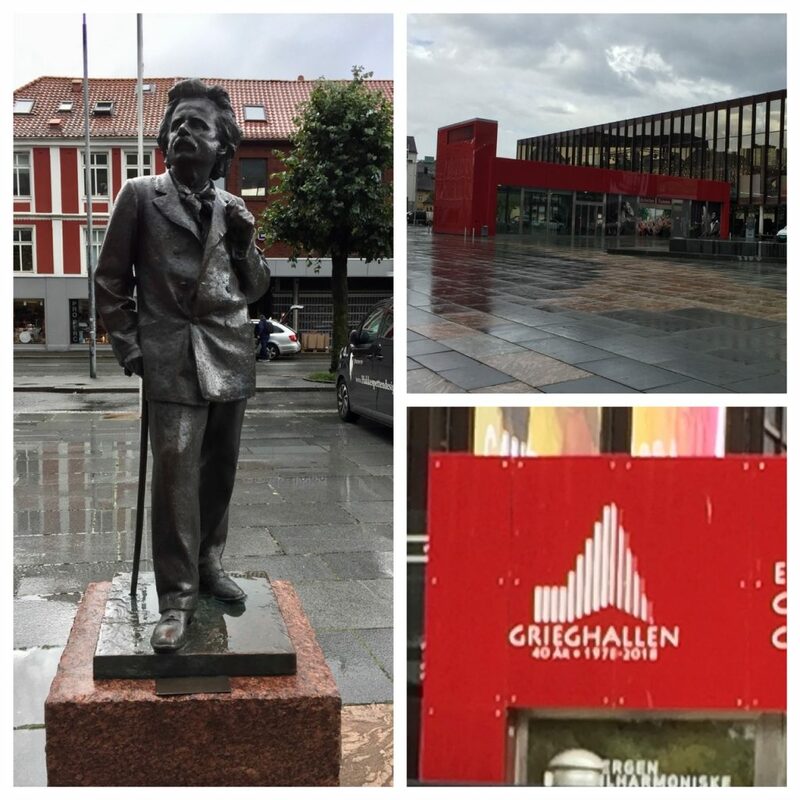 The Bergen Philharmonic Building pays tribute to Greig and the Bergen Philharmonic Orchestra is one of the oldest orchestras in the world. Edvard Grieg is an internationally recognized composer from Norway. When our tour was over, N and I stayed in town for some last minute sightseeing, shopping and lunch. There are many shops within the harbor alleys and picturesque storefronts. The first thing I bought was an authentic Norwegian sou’wester rain hat to keep my head dry and ears warm. I love this rain hat with it’s extended back flap that lets the water drip off my back. I wore it all afternoon as we walked around the city. An excellent invention! I now wear it when it rains at home too. My Norwegian sou’wester rain hat kept me dry. We saw toy trolls in the shops. Like in Denmark, trolls are creatures that are part of the Norwegian tradition. 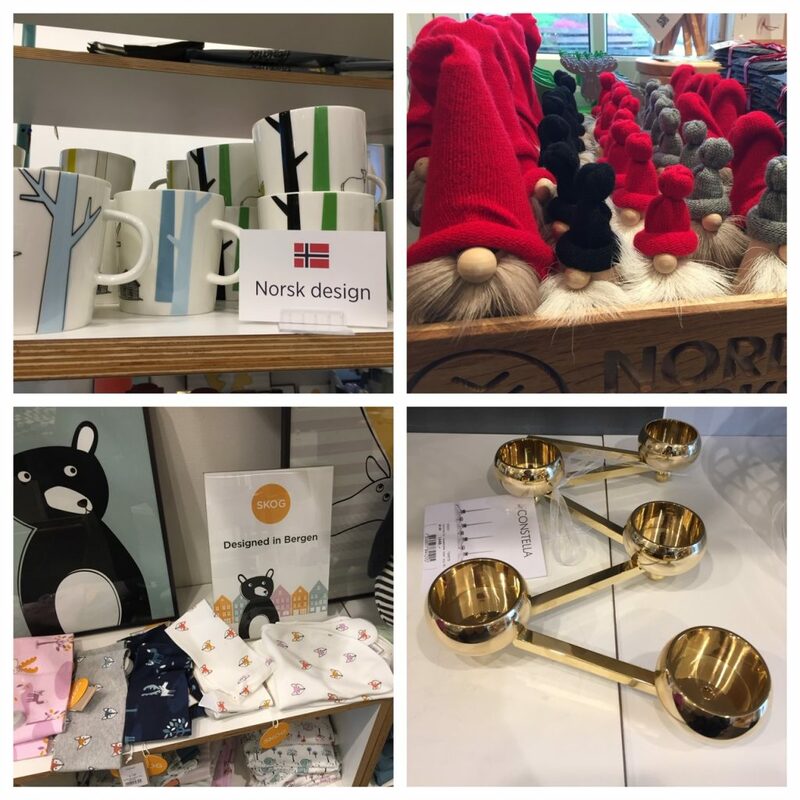 Scandinavian design was popular with housewares, along with authentic Nordic knitwear. Souvenirs from Bergen showcase Scandinavian design. After a delicious lunch of Norwegian salmon and pasta, we wandered around the city, stopped to see the fishermen selling their seafood and then walked back to our ship. 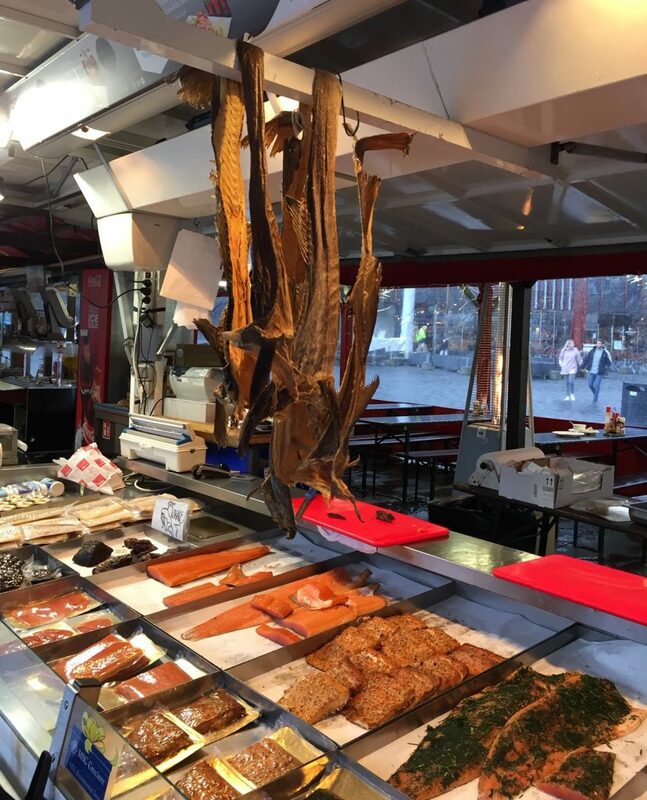 Fishermen sell Norwegian salmon at the Bergen market. 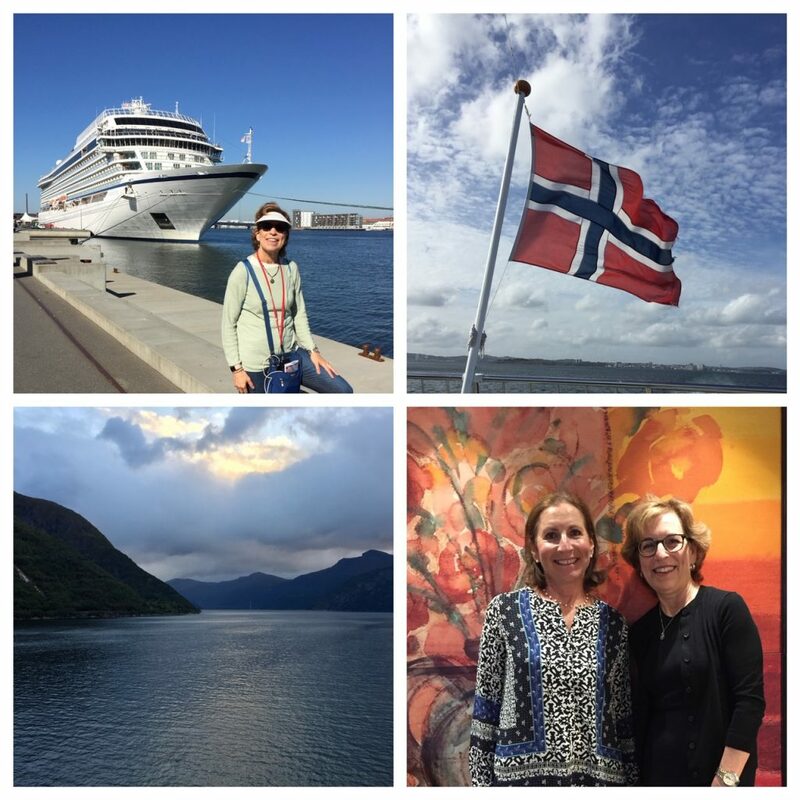 My sister N and I enjoyed our time on the Viking Star. undimmed by familiarity and ready to be transformed. See you on my next journey. For now, I’ll just try to say goodbye in Norwegian, ha det! Thanks Haralee. Hope you will get a chance to go back to Bergen one day. It’s likely changed a lot since ’73. What a wonderful story Judi! I love that you and your sister made the most of the day in Bergen despite the rain. That hat! What a remarkable find. Sue, thanks for your comment. 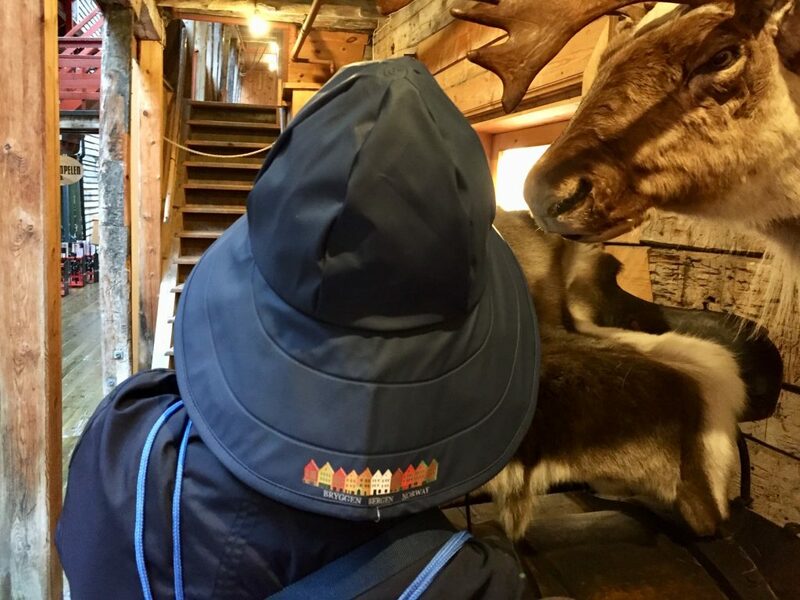 The rainhat made me smile, even in the rain.